There are many artists I admire. Mr. Michael Kenna is one of them. In fact, he’s my most favorite professional photographer. 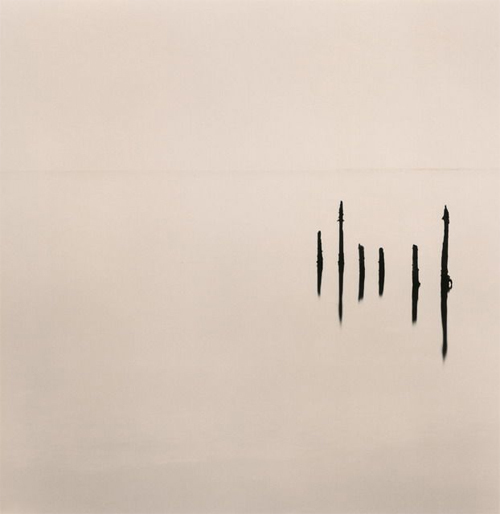 Mr. Kenna’s photos exude sophistication through simplicity. You sense the solitude, the etherealness, and tranquility, as if you were in the scene yourself. He accomplishes this by masterful composition, light and shadow. As a fan of simplicity in design and minimalism in art, I’m especially drawn to “Six Sticks” (pictured above). This particular photo entices me because of how simple and yet how telling it is. It captures the essence of a calm lake, without the inclusion of shore bank, trees, or anything else other than the six floating sticks and a subtle horizon. My mind fills the gap of what’s not there. Much to my surprise, he returned my email. One of the best emails I’ve ever received. Thank you Mr. Kenna, and internet. Very cool that he replied. I am wanting more and more to get into photography. Just gotta start saving up. Love the simplistic approach he takes. I love vibrant pieces too, however it is good to see the starkness that simplicity offers. Beverly Hills, CA – World-renowned, British-born, photographer Michael Kenna and Brazilian-born Hollywood author and actress Bianca Rossini collaborated to create a book of 45 black and white photographs and poetry titled “Love in black and white” Published by Nazraeli Press in Summer-2009. “Love in black and white is a work of extraordinary collaborative passion” – Don Heckman. “Love in black and white” Photography by Michael Kenna, Poems by Bianca Rossini – Published by Nazraeli Press in Summer-2009.